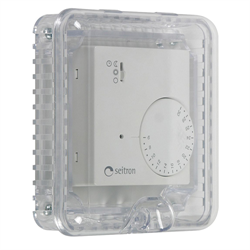 Molded of polycarbonate material, this protective cover is recommended for areas where damage or tampering to a thermostat is a problem. This device is easy to install, even if the thermostat is located in a public area. Holes in the frame allow free air circulation for proper operation of protected thermostats or energy sensors. An interior wall on the frame prevents objects from entering the cover.